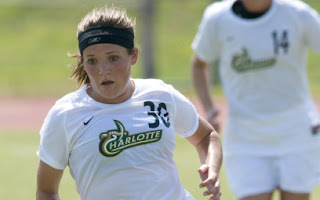 Charlotte 49ers junior midfielder Kirby Stenard's strong performance last weekend earned her a pair of honors. She was named to the Soccer America National Team of the Week and was named the Atlantic 10 women's soccer player of the week. Stenard scored pair of game-winning goals in a 4-0 victory over East Tennessee State and 1-0 win over N.C. State. She is tied for second on the team with three goals and second on the team with two game-winning goals. The women's team begins its quest for a fourth consecutive A-10 regular season title when the 49ers host Duquesne at 7 p.m. Friday at Transamerica Field. Charlotte was won 16-straight regular season A-10 games. --Charlotte 49ers forward Jennings Rex was named Atlantic 10 men's soccer rookie of the week for his performance over the weekend. Rex scored his first two career goals in the 49ers' 4-2 win over Winthrop in the championship game of the Charlotte Nike Invitational on Sunday. The men's team returns to action on Saturday, playing at UNC Greensboro.